When a detachment of soldiers was separated from a legion the resulting unit marched under a special banner, the vexillum. Vexilla were a standards, much like the aquila (eagle) or signa, yet their use was much more limited. 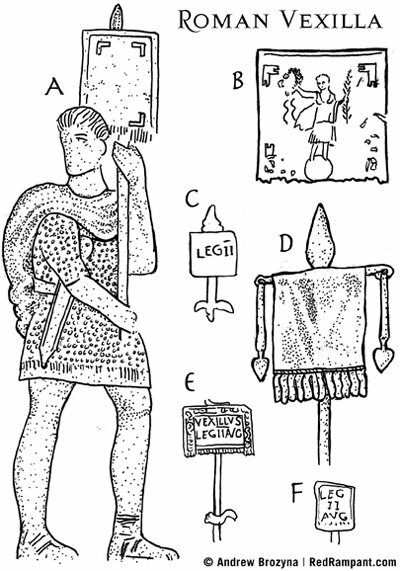 The vexilla was also used by the legionary cavalry and alae. It seems this banner was employed on a regular basis, contrasted with the legion's occasional use. Only one example of vexilla has ever been found—the 3rd century example from Egypt (fig. B). This was made of linen. The banner cloth was found alone, but by looking at sculpture we can tell that it hung from a horizontal bar which was attached to a pole. The horizontal bar often had straps with pendants dangling on either side of the cloth. The pole was often topped with a spear head. This spear point could be a simple leaf shape or more decorative. A sculptural piece, such as the goddess Victoria, might also appear atop the pole. The Egypt vexillum (fig. B) was decorated with Victoria (godess of Victory) dominating the globe. In the corners can be found the gamma motif (named after the Greek letter which looks like an upside down "L"). These gamma figures are also seen on the vexilla of the Adamklissi monument (fig. A). The name of the legion could also appear on the banner. This is born out by a number of carvings. (fig. C). The historians Tacitus (in The Histories 2.85) and Suetonius (in The Twelve Caesars, Vespasian 6) both make mention of the leader's name written on the banner. Although there is no direct evidence, it is possible that the legion's emblem may also have appeared as a design. Suetonius (Augustus, 25) wrote that the general, Agrippa, recieved a blue banner from Augustus. The vexillum found in Egypt is red cloth. The vexillum depicted in the fresco at Dura Europos is also red (a color plate of this Terentius painting can be seen in James, p.xxv). Vexillarius depicted on the Adamklissi monument. Intact vexillum from Egypt, probably 3rd century AD. Dimsnsions: .47m x .5m (Dixon and Southern)(Connolly, p.219)(Bishop and Coulston, p. 185-186, 188)(Rostovetzeff) Connoly wrote that it is currently housed in the Hermitage Museum, St. Petersburg, Russia. This may be an error. Others place it in Pushkin Museum of Fine Arts in Moscow. Sculptural relief of vexillum on a stone tablet left by Leg. II Augusta at Benwall. Benwall was a fort on Hadrian's wall built during the reign of Hadrian. Vexillum depicted on Trajan's Column, Rome. 1. Bishop and Coulston. 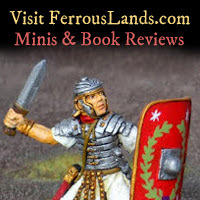 Roman Military Equipment, Second Edition. Oxbow Books, 2006. 2. Connolly, Peter. Greece and Rome at War. Greenhill Books, 1998. 3. Dixon and Southern. The Roman Cavalry. Routledge, 1992. 4. James, Simon. Excavations at Dura-Europos, 1928-1937. Final Report VII. The Arms and Armour and Other Military Equipment. British Museum Press 2004. 5. Keppie, Lawrence. The Making of the Roman Army. University of Oklahoma Press, 1998. 6. Rostovetzeff, M.I. 1942 "Vexillum and Victoy" Journal of Roman Studies 32. p.92-106. Note: I have not yet seen this article, but I believe it has a detailed account of the vexillum found in Egypt.